The next time you find yourself in an elevator take a quick look around. Statistically, one in three of you has high blood pressure. And another one in three has prehypertension or BP numbers that are running higher than normal. High blood pressure is one of the most common health problems here in the United States. And the number of folks affected is growing. That means if YOUR numbers aren’t already rising, they may soon be. But don’t panic. I have a solution. And trust me, it’s one you’re going to LOVE. Head to the grocery store and make a beeline for the candy aisle. Pick out a decadent chocolate bar. As soon as you get home indulge in a few delicious squares. In fact, keep it up for the next 30 days, and you could SIGNIFICANTLY reduce your blood pressure, according to a new study. So what’s the catch? You just need to make sure it’s dark chocolate with at least 90 percent cocoa. In other words, not actually a catch at all, if you ask me. For the new study, the researchers recruited 30 younger healthy folks. The volunteers were randomly assigned to one of two groups. And an extensive baseline evaluation was done on each to measure their current heart health. The first group was then treated to a daily dose of 20 grams of a 55 percent cocoa chocolate. And the second group indulged in 20 grams of a 90 percent cocoa chocolate every day. The participants were asked not to eat any other flavanol-rich foods during the study. That way it would be easy to see the effect the chocolate did or didn’t have. After 30 days the researchers reevaluated everyone’s heart health. And in just ONE MONTH both groups had some remarkable changes. All the participants had significant improvements in their blood pressure. No matter whether they ate the 55 percent or 90 percent cocoa chocolate, both their systolic and diastolic numbers dropped. But the darker chocolate group made the MOST progress. The folks who ate the 90 percent cocoa chocolate also had healthier pulse rates. Plus, they had improved interactions between the left side of their heart and their arteries… a sign of reduced pressure. Now at first glance, those drops in blood pressure might not seem dramatic. But the truth is they ARE quite impressive. In fact, for some folks that kind of movement could be all it takes to travel from prehypertensive into the “perfect blood pressure” zone. Plus, don’t forget, the volunteers were both young and healthy to start with. Which makes the improvements even MORE dramatic than they may appear at first. Imagine what could happen for folks who are a bit older or not in such great health to start with. The drops in blood pressure could be MUCH larger. 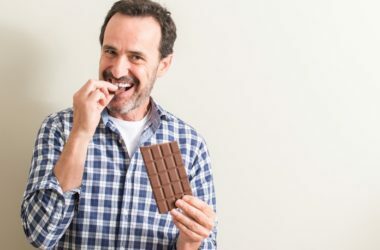 The researchers say flavanols—which are found naturally in chocolate—are most likely responsible for the improvements. If you want to try to recreate this effect at home, choose a chocolate bar that’s at least 90 percent cocoa. And then replace one snack a day with about four squares of the chocolate… or a portion about the length of your index finger.